This past Friday I taught a class about an hour down the coast, and as it was a Friday I decided to make a camping trip of it. 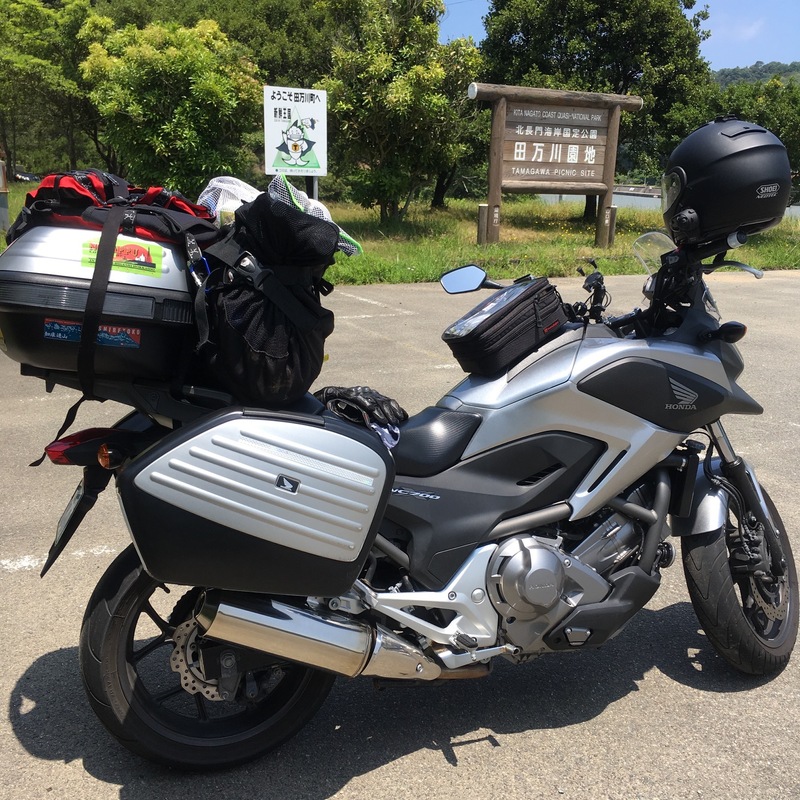 The class was in Masuda, which is the most south-western city in Shimane, so it was only an extra 20 minutes to the closest camp site over the Yamaguchi border. So Friday morning I headed out around 7:30 AM to head down to Masuda to teach my class. As always, the ride down route 9 was fantastic. While I may occasionally complain about traffic on that road, I must admit the ocean views along the way more than make up for it. After teaching my class I took route 191 south, past the Hagi-Iwami airport, and along to the Tamagawa Campsite. I arrived to find a completely empty site. I took my time settling into camp; setting up the tent, tarp, hammock, and getting my lay of the land. 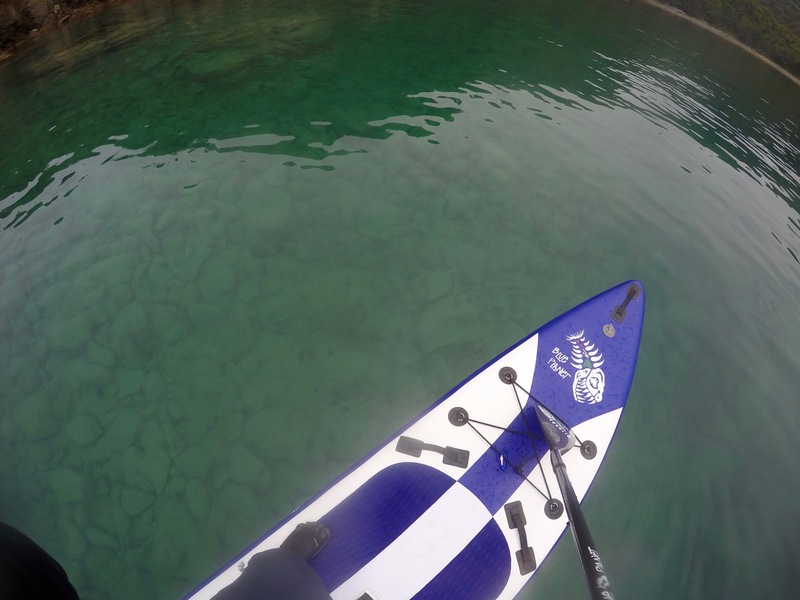 The walk to the beach was only about 200 meters, and I found the perfect launch point for the SUP. 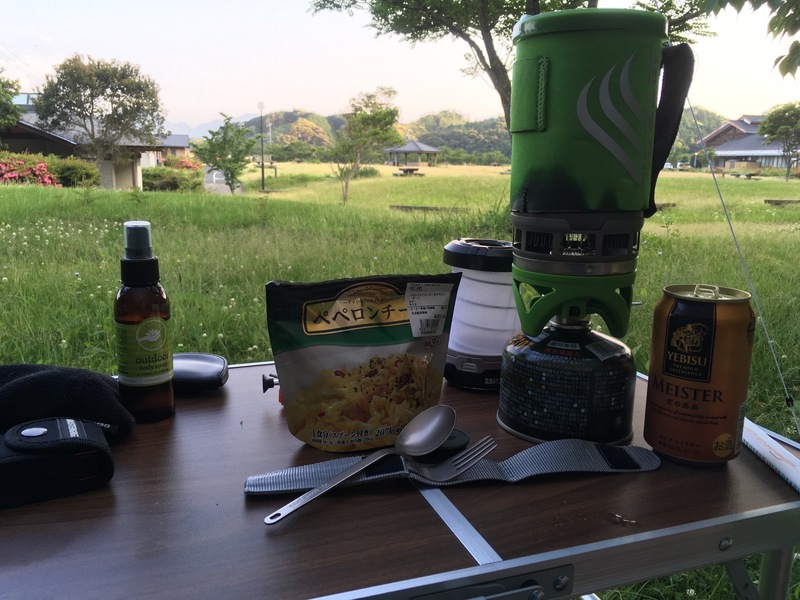 However, it was getting late in the afternoon, so rather than inflating the board I decided to cook some dinner, drink a few beers, and head off for an onsen. Did I mention that the Tamagawa campsite has an onsen? After falling asleep to the distant slapping of jumping fish in the river beside the campsite, I awoke around six AM to an empty campsite. It was still just me, the crows, mosquitoes, and occasional lost crabs. I took my time, relaxed, and cooked up some breakfast before inflating the SUP. The forecast promised for cloudy skies until 14:00, when the claim was that thunderstorms were forthcoming. As such, I decided to get on the water early, and hit the beach at around 9:30. 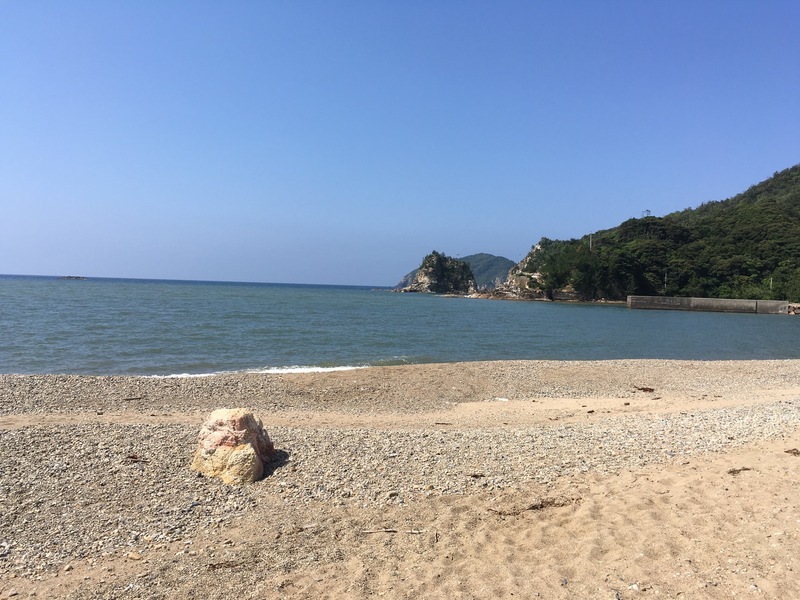 The Tamagawa beach is a fishermen’s beach. It is only about 70 meters wide, and I put in between fishermen on both sides. The beach was more stoney than sandy, but the water was flat and welcoming. 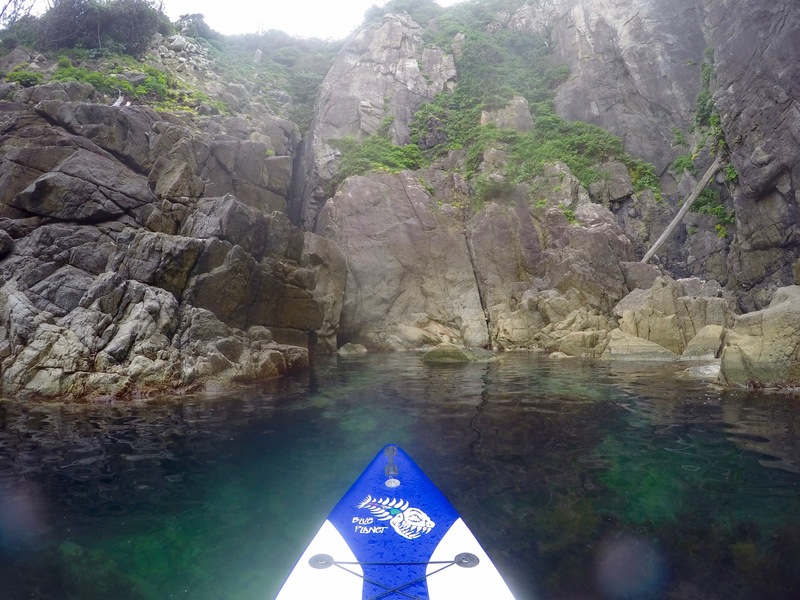 Putting in was a pleasure, and the first shot straight out to a small islet/rock off the coast was a smooth paddle. 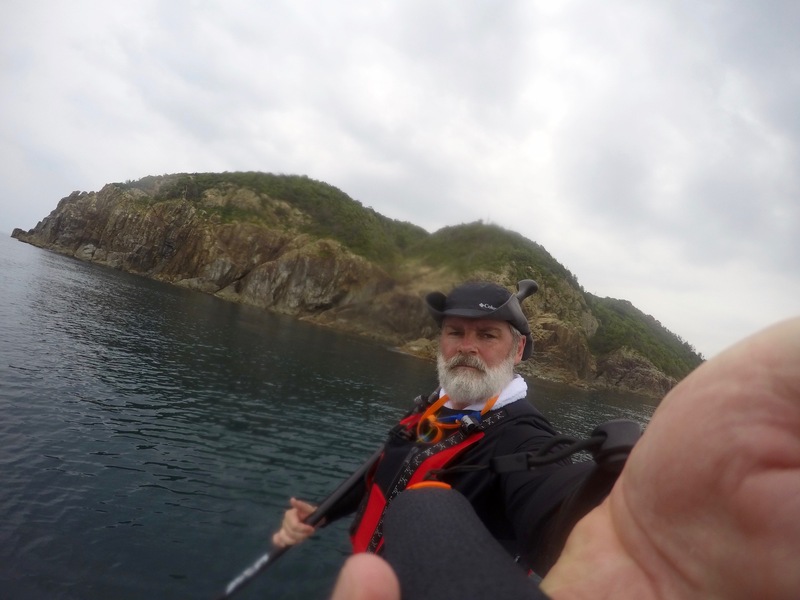 The plan was to keep things simple, as it has been a few months since I have paddled, so I set my sights on reaching the tip of the furthest visible outcrop of the coastal cliffs. This proved to be about three kilometers away. 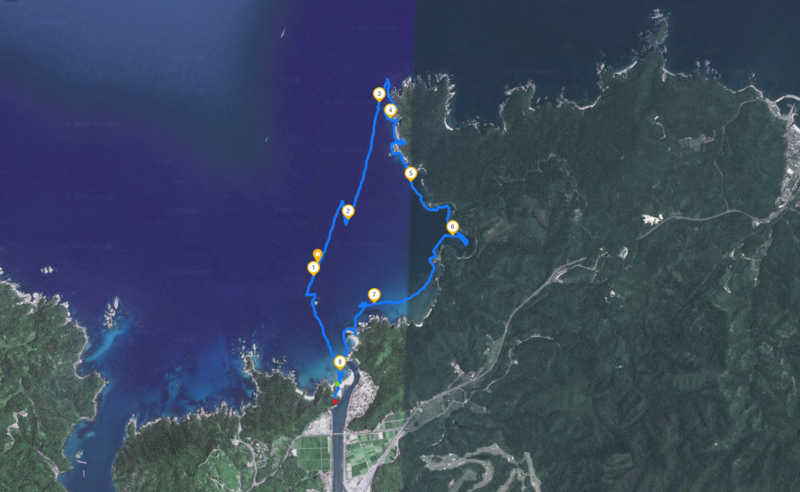 Along the way I found myself sidetracked twice; once by a an odd floating yellow seaweed island about three meters across, and then again by the appearance of a small jellyfish which I chased unsuccessfully. Interesting formation. Is that a saddle horn? 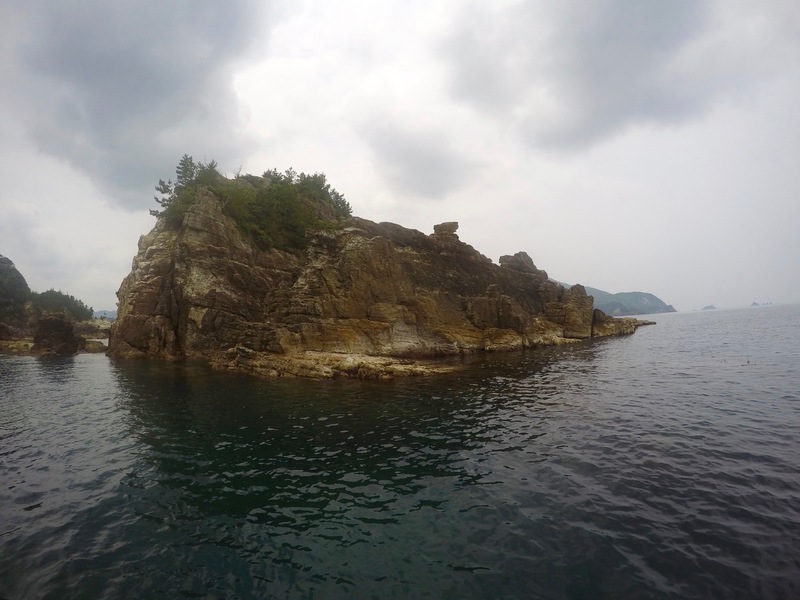 Once I reached the furthest outcropping, I paused to look off at Shimane in the distance, gave the token nod/bow to the fishermen who had planted themselves there for the day, and then turn back for camp. On the way back I opted to hug the cliffs and enjoy the sights a bit. While I neglected to take photos of them, there were a lot of 亀の手 (A.K.A. Capitulum mitella) everywhere along the cliff walls at the waterline. Apparently they are a bit of a delicacy, so I guess I will be collecting some next time I am out paddling…. The great thing about hugging the cliff lines is that you come across all kinds of caves and little coves. I did find some great caves to explore, but I due to the tricky nature of navigating caves I did not get any photos. 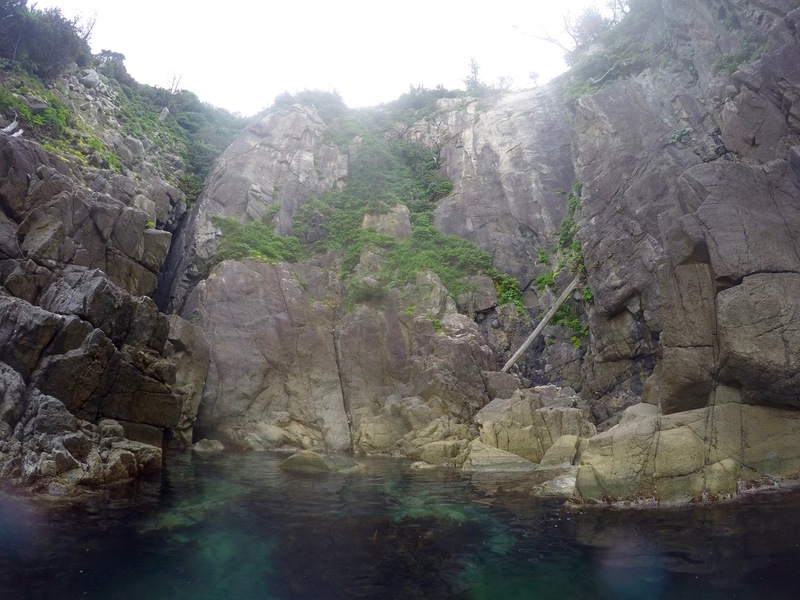 However, did get some shots of the coves and rock formations. One cove was especially interesting, as the wall was covered in greens which were apparently populated by frogs. 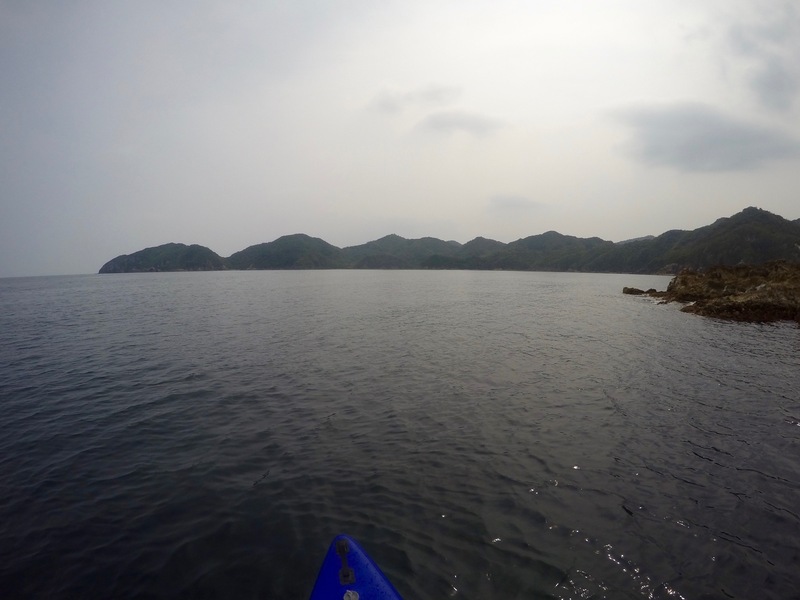 The strong disconnect of paddling into a sea cove to the music of frog songs was a bit odd to me. I am accustomed to the keening of the birds, and the slapping of the waves, but frogs were a bit of a surprise. After the frog cove, I found a larger cove with water like glass. The sea floor was completely covered with what looked like river stones. 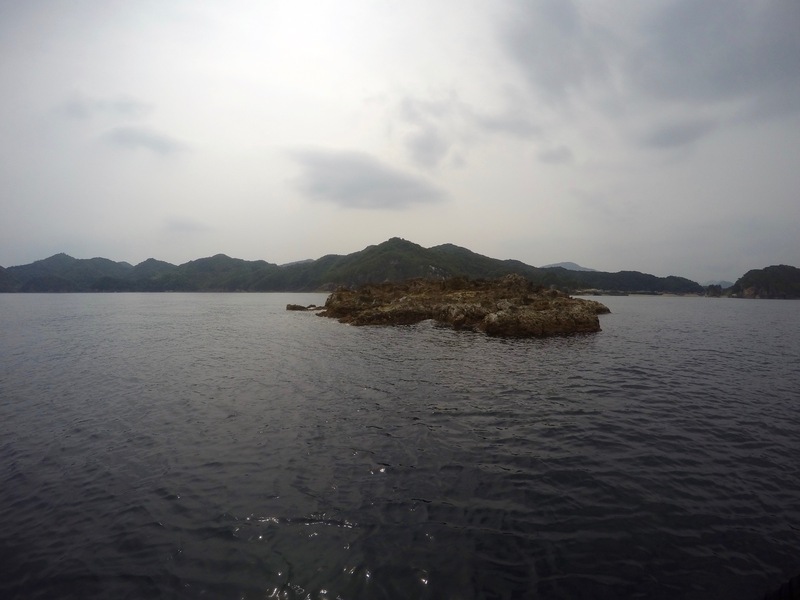 I paddled slowly and watched the small fish swim along seemingly oblivious, or indifferent, to my presence. It is these moments of gliding slowly over the crystal clear water, with a living world existing below you, that you can find an amazing sense of peace on the water. As the forecast had promised thunderstorms in the afternoon, and I had no desire to be the tallest thing on the water at that time, I pulled back in around noontime. 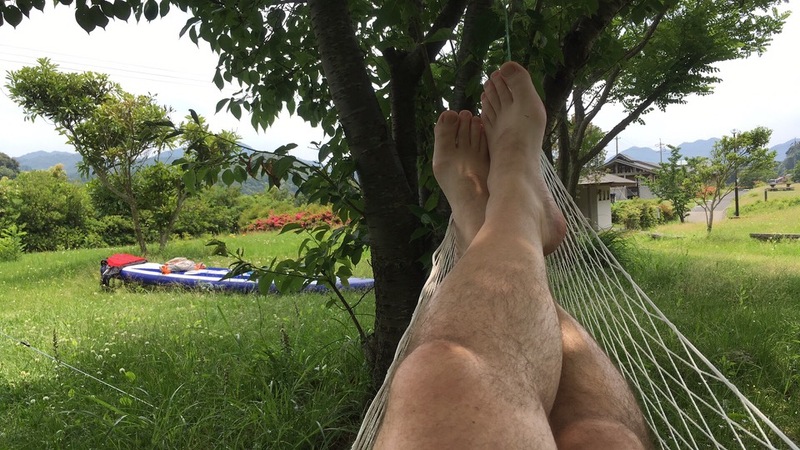 Eight kilometers was enough for my first water walk of the season in Japan, so it was time for a nice hot bowl of instant ramen, and then some hammock time. 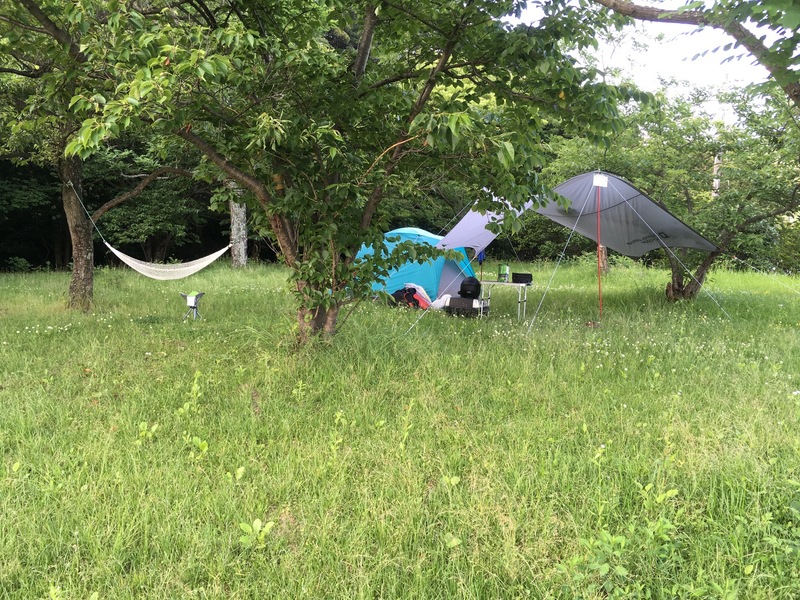 Overall, I would definitely go back to the Tamagawa camp site. 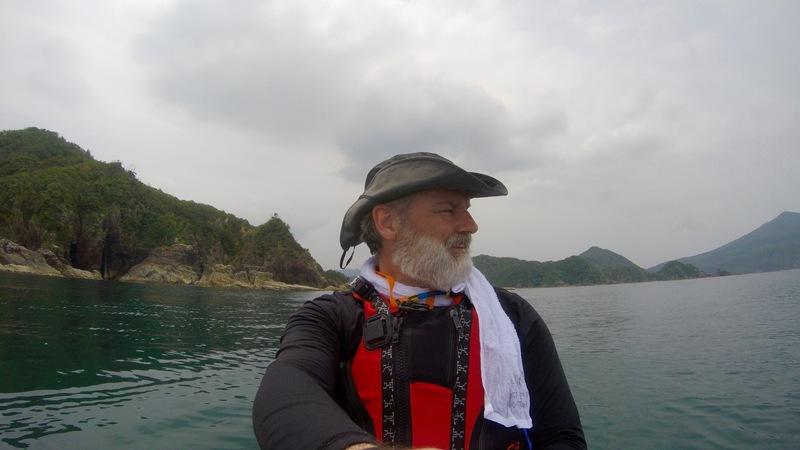 The onsen was fantastic, there is a rest stop and convenience store just 100 meters down the road, and the paddling is fantastic. 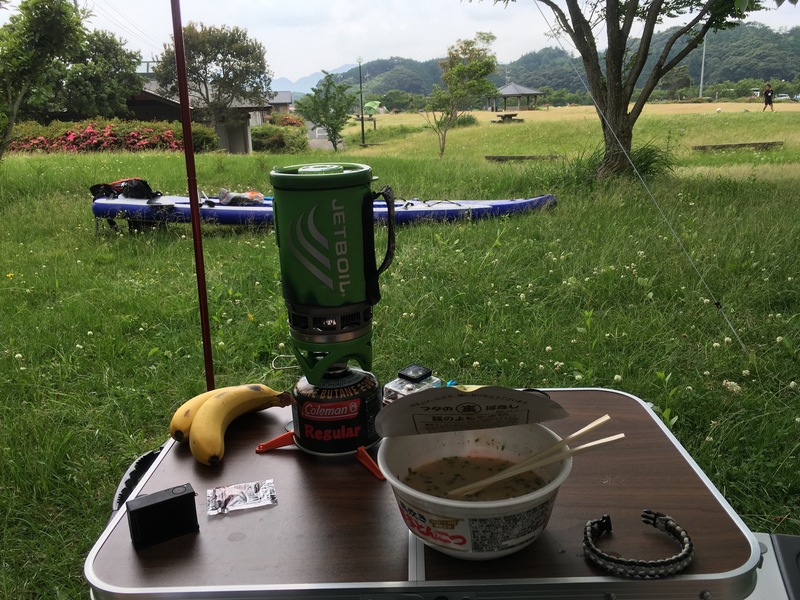 The trip was actually a bit of recon, as I had previously identified this campsite at the perfect starting point for a Shimane West-to-East paddle. The coast is only about 300 km, so I figure if I break it into shorter paddles it can be done easily enough. 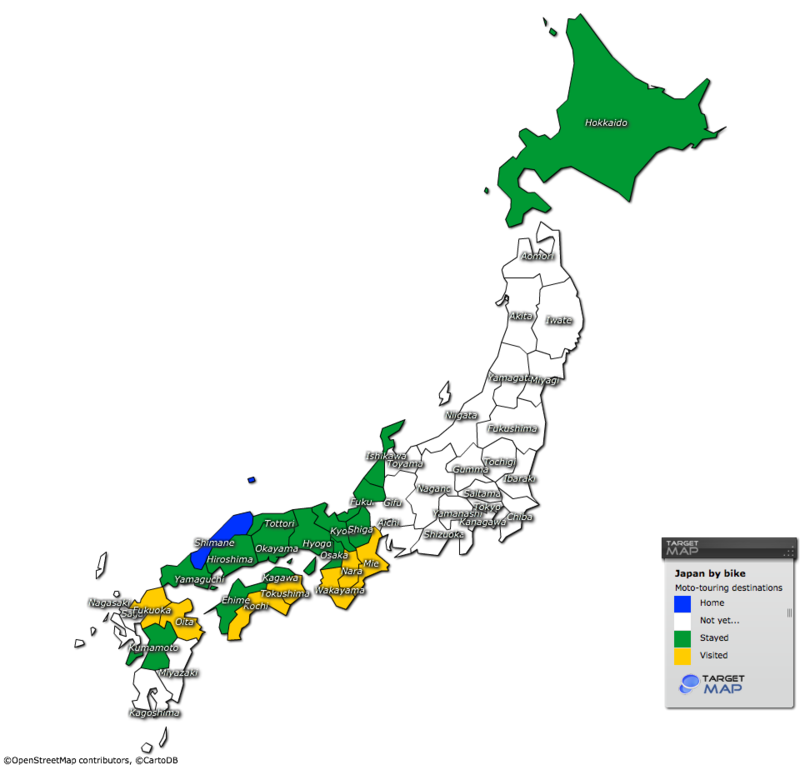 As such, I can’t wait to head back to Tamagawa to do the first leg of the trip.